Walking home tonight from a beer and a friend, I remembered to love the heat. I love it through a verb I learned, in an underused language, which is intended to express the sluggishness of a way-too-hot summer. It translates roughly as ‘to laze like a dead animal.’ Appropriate. Funny. It holds onto the sumptuous pleasure that arises on those nights when you can smell the warmth in the air. I first reveled in that particular bliss on a drive home one hot Missouri night. My Olds Cutlass Sierra sliding through its own tunnel of light between slowly undulating river-bottom cornfields and forests, barely needing guidance to find the point of light marking my parents farm somewhere out there in the dark. Thinking of some young thing I had been dancing with over an underage beer. Feeling the beat of some scratchy old mix tape dance through me over the song of tires and wind and bullfrogs. Smiling at how the heat on the inside and the cool breeze kept the windows foggy long after she was gone. Taking a corner too fast, I felt the heat through the mechanics of my ride. Felt the tires change tension, a slip in asphalt hot enough to be sticky – – like the release of a hand pressed too hard on warm skin, snapping ahead, eager. I felt it as I leant into the wheel and accelerated for the joy and fearlessness of 4 a.m. I felt it as a slip of breeze snuck between my t-shirt and shoulders and licked a bead of sweat. That feeling. That prickle that climbs along my scalp. Momentary. Cleansed by the wind. That is the love of heat. The love of relief built in. The road began to behave again, the wind rolled in with the must of sweet summer corn. 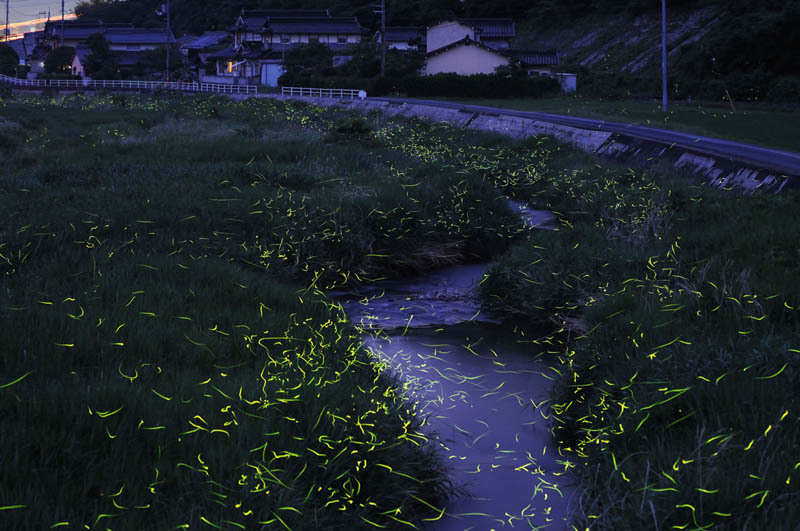 A burst of fireflies. Thick that time of year. Meeting their squishy destiny against the glass between us. Luminescent streaks painting wild, warp speed streaks across the windshield. A swarm suddenly silenced in a series of pretty little endings, all adding a little shine to the rest of the road home.